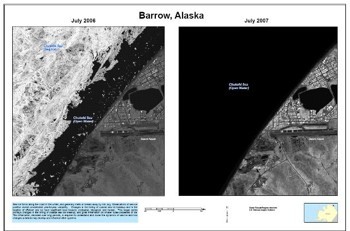 The head-in-the-sand attitude of the Bush administration is again underscored by the recent release of photographs taken by U.S. spy satellites. It’s more proof that the polar ice sheets are retreating farther every year — assuming of course that one is willing to believe in science and in facts … and not only when they suit us, but always. It’s easy to think that puny humans can’t change something as big as planet Earth, but one only need take a look at photographs of the Earth taken from space to realize that the Earth has got only a tiny sliver of an atmosphere. And when 6 billion humans unleash the power of man-made technology, we can indeed make an impact. It’s up to us to decide whether we want that impact to be positive or negative. As the recent asteroid impact on Jupier shows, we are still a vulnerable species. Let’s not make things worse for ourselves by hiding crucial scientific evidence under nonsensical “national security” concerns. Indeed, instead of concealing data, all the evidence of the effects, the sources of the those effects, and the possible consequences of climate change should be considered a topic of significant security concern, both global and national. A concern to which military leaders and policy experts testified last week before the Senate Foreign Relations Committee. It’s difficult enough persuading developing nations to accept legally binding agreements on reducing carbon emissions as shown by India’s recent refusal to do so during Secretary Clinton’s visit to India. Developing nations such as India still talk about having very low per capita carbon emission levels, conveniently forgetting that the populations of some of these countries have increased by 300 percent and more. To take an example, India’s population has more than trebled since independence in 1947. With a population that’s nearly four times that of the United States, it’s sobering to realize that even if India’s per-capita emission of carbon were only one-quarter that of the United States’, the total carbon emitted by India would equal that of the United States. Whether we like it or not, the climate doesn’t really care about per capita emissions.